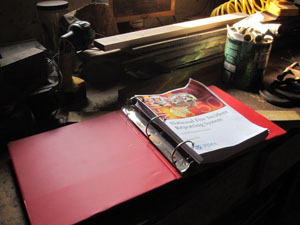 Working on a project for the fire department, I printed about 250 pages double sided. It is the manual for some software I use that allows me to enter all our calls into a national system. Once the printing was all done, I needed to 3-ring punch all the pages. I looked at the stack of paper, and remembered Alice’s 3-ring punch, which has saved us a lot of work over the years. 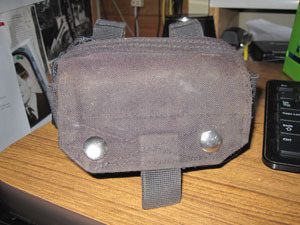 This punch is a consumer grade, meaning you can only put 5-10 pages through it at a time. While this is fine for most punch jobs we do, I just couldn’t see myself sitting at the table for an hour making hundreds of little paper circles. What to do? This is where the tool-guy mentality kicks in full force. “I have a drill press! That thing can drill a hole in wood or steel! Paper is just processed wood!” (Tool-guys tend to think in exclamation marks.) 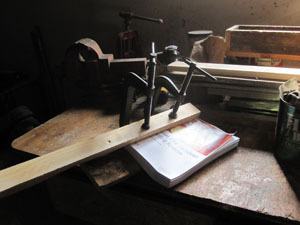 The challenge was to clamp the wad of paper tightly enough that it can’t move while the holes are being drilled. I grabbed the first two chunks of scrap wood I found in my pile, a couple of c-clamps, and put the thing together. Next I made the pencil marks on the scrap wood for the holes to be drilled. (I had already penciled in the marks once on the top sheet of paper that I’d just covered up with the scrap wood.) In order to get the whole apparatus to sit properly on the drill press table, I had to move the clamps around a bit, but in just a few minutes, I had my holes drilled, the paper installed in the notebook, and my camera out for the picture. Knowing myself, I imagined an alternative outcome. While the project to punch the holes with the consumer grade punch would have taken an hour or so, things could have gone wrong with my drill-press technique that would have caused the project to have taken a lot longer than it did, such that I would have wound up spending more time on the drill press that I would have with the paper punch. Would I have been ok with that? You bet! 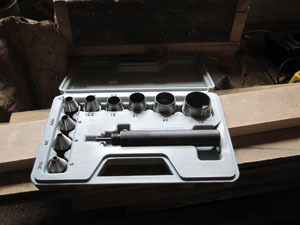 Doing the job in my workshop using my lovely tools is preferable for me. My thinking is, in saving a half hour of time, I may determine that I need another tool to make the job go easier. With Amazon Prime, it is so easy to sit down and get the new tool ordered, that I barely interrupt the flow of word by doing it. It is just the way we tool-guys think. I walked in the house the other day, having just taken off my sweatshirt and shaken it vigorously. I’ve learned that if I’m working with firewood, it is best to leave as many bugs, bark patches, and clots of sawdust outside as possible. After 40+ years at it, I’m getting better at this. Alice and I hosted a group of 4H young people and their parents at the Estivant Pines this week. After we gathered in the parking lot, we gave them a short talk about what to do if you get lost in the woods, and then headed out on the trail. 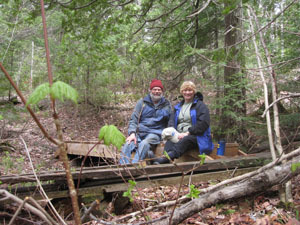 We stopped in a beautiful grove of big white pines and talked to them about the sanctuary. One thing I wanted them to understand is how unique the Estivant Pines is. This sanctuary is the largest stand of virgin white pines in Michigan. I thought it would be interesting for them to hear why I believe this couple of hundred acres on the northern tip of Michigan’s UP is all that is left of the virgin trees that once covered our state. I told them the story of the wealthy Frenchman that owned the property for the copper mines that were on it. I explained that since he was wealthy, he probably didn’t see the need to cut down the trees for money. The fact that he lived in France made it more difficult for the loggers to reach him and make a deal for the timber. This area is also very rugged and difficult to reach, the soil is thin, and the trees are not perfect specimens. This and other reasons probably saved our pines. As we drove home from the event, I thought some more about the subject. Sitting in that beautiful grove of white pines with that group of eager young people made me feel very peaceful. There is nothing else I am aware of that makes me feel this way. But the monetary value of these trees cut down, sliced up, and delivered to the sawmill is high. And as a people, we’ve decided that the lumber value is so much higher than the aesthetic value that just about every corner of our state has had its virgin trees removed. Places like the Estivant Pines constitute a tiny fraction of what was once here. We do not often question this attitude toward our natural world. “Logging provides jobs,” I often hear folks say. I would argue that a couple of men could have logged the Estivant pines in less than a year, converting that property to the same stump fields that once covered the entire state. Those couple of men would probably have appreciated the work, but what about the property? 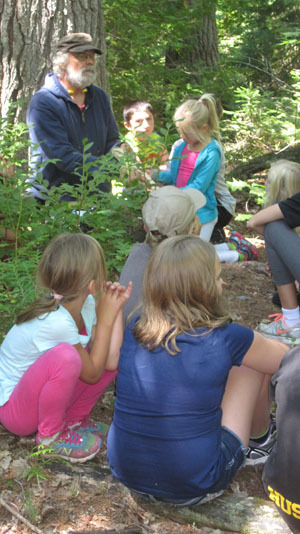 The Estivant Pines is, we believe, the second most visited place in Copper Harbor, after Fort Wilkins. There are hotels, restaurants, gift shops, and others in Copper Harbor that depend on their guests having something fun to do while they’re visiting. Is it possible that the wages those couple of loggers could have earned are eclipsed by the value the sanctuary has as a tourist destination? As we drill for oil, dig for ore, and cut down our forests, we see our quality of life increasing, and all seem to agree this is a good thing. Perhaps we need to take a longer view of this. Perhaps there are intrinsic benefits to leaving some places untouched. Perhaps such places are more important to our well being than we were aware of. Maybe when we tune our capitalist system, account needs to be taken of everything that is lost when such an area is disturbed, and not just the value of the lumber that is generated. You are currently browsing the Rural Life in the UP of Michigan blog archives for August, 2015.